As I write this, we can see lots of brilliant ‘spring green’ around us: The canopy of the trees is just starting to pop; the grass has already been mowed twice[! ]; and we saw the first bits of bud break this past Thursday [11 April 2019]. And the skies are grey and getting darker. There are some violent storms forecast to reach us this afternoon, having already passed through our neighbors in the deep south. We finished the final few vines of winter prune yesterday, just in time for bud break. We are doing a bit of renewal in the vineyard, so it looks a little naked out there compared to ‘normal’ years. But we had never renewed cordons [leaf 11 in the Cabernet Sauvignon] so it was time. It will help the vines regain balance, and it will reduce disease pressure, just by removing old wood that harbors spores of the very diseases we fight. Eddie and I built a barn for his sister this winter over on the paternal grandparents’ farm. It was our winter project, and we had expected it to be our only construction for a while. We have just a little left to do on that building: We were short a couple of pieces of siding that have been ordered; we need to have some concrete poured, which will be the only bit of work on this building that we don’t do ourselves; we still need to install the garage and walk-out doors; and we need to get power connected. It is a short punch-list, and it should only take us a couple of work days to get it finished. 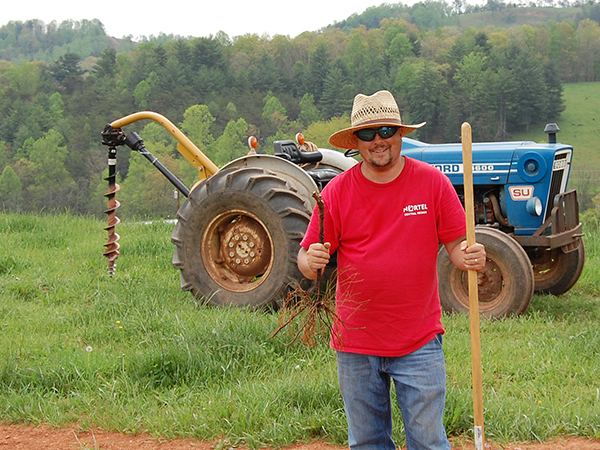 With the 2019 WNC AgOptions grant we announced in the last post, it changed our plans for the spring. Now we are just about ready to break ground on the new barn here at Addison Farms Vineyard. This new space required a little destruction to make room. We removed 54 vines from our Cabernet Sauvignon, including what I have always called Vine One, the very first vine planted at Addison Farms Vineyard.